HVGA 3.5-inch TFT color screen, resolution 320 480, LCD white back light, capacities touch screen. The failsafe function is used to protect the model and user in case of signal loss. Support Online update with standard USB cable. Transmitter with 3.7V 4300mAh battery. 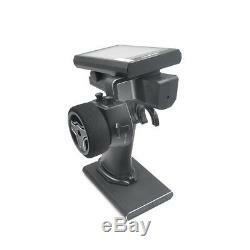 Suitable for RC boat and RC car. Specifications: Item Brand: Flysky Item Model: FS-NB4 Channel: 4CH Power: <20dBm(EU) 2.4Ghz Product: AFHDS 3 Modulation: DSSS Channel Response: <13ms Low Voltage Alarm: <3.6V Data Output: Micro USB Antenna: Built-in Single antenna Battery: 3.7V 4300mAh lipo Battery(built-in) Charging Time: about 2 hours Working Time: about 8 hours Item Size: 190 129 114mm Item Weight: 520g Package Information: Package Size: 24 22 8.5cm / 9.44 8.66 3.34in Package Weight: 1120g Gift Box Package. To avoid the 2.4Ghz radio signal interference. Please always keep your model in sight and within 300m and make sure there is no other signals around, cause they may block the RF signal and lead to loss of control. Never grip the transmitter antenna during operation. It significantly degrades signal quality and strength and may cause loss of control. Do not touch any part of the model that may generate heat during operation, or immediately after use. The engine, motor or speed control may be very hot and can cause serious burns. Package List: RM11225 1 Remote Control 1 3.7V 4300mAh lipo Battery(built-in) 1 FGR4 Receiver 1 USB Cable 1 Spare Grip Cover 1 Adjustable Holder 1 English Manual. The item "Flysky FS-NB4 2.4G 4CH Noble Radio Transmitter with FGR4 Receiver HVGA 3.5 F9R7" is in sale since Tuesday, December 4, 2018. This item is in the category "Toys & Hobbies\Radio Control & Control Line\RC Model Vehicle Parts & Accs\Control, Radio & Electronics\Receivers & Transmitters". The seller is "quickkway" and is located in Shen Zhen.